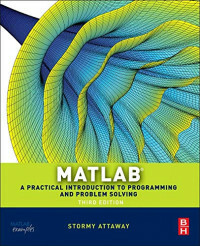 MatLab, Third Edition is the only book that gives a full introduction to programming in MATLAB combined with an explanation of the software’s powerful functions, enabling engineers to fully exploit its extensive capabilities in solving engineering problems. The book provides a systematic, step-by-step approach, building on concepts throughout the text, facilitating easier learning. Sections on common pitfalls and programming guidelines direct students towards best practice. The book is organized into 14 chapters, starting with programming concepts such as variables, assignments, input/output, and selection statements; moves onto loops; and then solves problems using both the ‘programming concept’ and the ‘power of MATLAB’ side-by-side. In-depth coverage is given to input/output, a topic that is fundamental to many engineering applications. Vectorized Code has been made into its own chapter, in order to emphasize the importance of using MATLAB efficiently. There are also expanded examples on low-level file input functions, Graphical User Interfaces, and use of MATLAB Version R2012b; modified and new end-of-chapter exercises; improved labeling of plots; and improved standards for variable names and documentation. This book will be a valuable resource for engineers learning to program and model in MATLAB, as well as for undergraduates in engineering and science taking a course that uses (or recommends) MATLAB.